Story 1: teachers at one of the elementary schools we visit decided that one little boy (we’ll call him Billy) could benefit from being with a therapy dog, mainly as a result of domestic trauma Billy had been experiencing. The trauma had been so severe that Billy had become a selective mute and hadn’t spoken to anyone in six months. Because of the therapeutic help that our dogs can bring, the teachers duly signed Billy up for the program and, each Thursday morning, Billy would visit with one of our dogs. Bringing a book with him to show the dog, Billy would just point to the pictures rather than read to him. The same pattern of behaviour happened each Thursday until the fourth week when, out of the blue, Billy started talking to the dog about the trauma he had experienced. Not having spoken for six months, the teachers were completely amazed that Billy had decided to share his innermost feelings with the dog but realized that they were witnessing a breakthrough in the healing process for Billy. The reality was that Billy had developed such a strong bond with the dog, be it in a relatively short time, that he felt safe and secure in telling his traumatic experiences to the dog and unburdening what he’d been carrying around in his mind for the past six months. Story 2: George was in his golden years and found himself being cared for at one of the seniors’ lodges we visit with our therapy dogs. Being a dog lover all his life, George really missed the companionship that his dogs had brought him in his younger days. As such, it was no surprise that George never missed an opportunity to be in the lounge the days when therapy dogs were scheduled to be on site so he could visit with them. The time came when George was taken ill and he passed from this earth. A short time after his passing, his daughter wrote to the handler of the dog that George visited with most. In her letter she expressed on behalf of her father what a blessing he had felt to know this particular dog and what the relationship had meant to him. 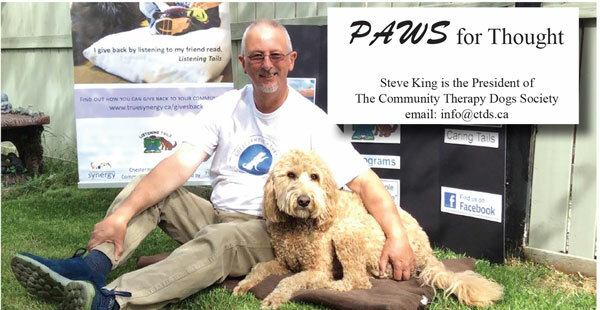 Foregoing any other event that may have been organized at the lodge on the day of the therapy dog’s visit, his week centred around seeing the dog. Talking to the dog, petting the dog and sharing stories with the furry, non-judgemental listener was all George ever wanted, witnessed by the family whenever he would talk about his special friend. Dogs can tell when people need their loving help and both Billy and George had been at the right place, at the right time, to have the stars align for them.